Hampton Inn by Hilton Boulder Louisville welcomes superstar comedians, Jeff Foxworthy and Larry the Cable Guy, as they reunite at 1st Bank Center on Saturday, February 27th. Both comedians will be performing all-new content, before heading back onstage, for an encore of the jokes that will keep you laughing all the way to your car. Tickets begin at $59.50 and are available at http://www.1stbankcenter.com. Hampton Inn by Hilton Boulder Louisville welcomes fans to laugh all night and wake up to a complimentary hot breakfast buffet the next day. Less than ten minutes from 1st Bank Center in Broomfield, Hampton Inn by Hilton Boulder Louisville welcomes all Roughrider fans to stay the night after the victory. Hampton offers great amenities, comfortable rooms and group accommodations. Amenities include free Wi-Fi, complimentary hot breakfast buffet daily, indoor pool, fitness center and much more. Guests may choose from king, double queen, king study and accessible rooms, available upon request. Guests will enjoy the hotel’s close location to Boulder Valley Ice, Pearl Street Mall, Flatirons Crossing Mall, University of Colorado at Boulder and much more. For reservations and more information on the Hampton Inn by Hilton Boulder Louisville, please visit http://www.louisvillehampton.com or call (303) 666- 7700. 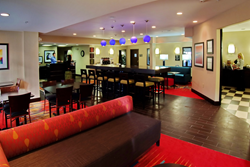 The Hampton Inn by Hilton Boulder Louisville is proudly managed by Stonebridge Companies in Denver, Colo.